In a boost ahead of the 2016 AFL Premiership Season, Allied Express Transport has signed as the Western Bulldogs' newest Platinum Partner. Allied Express is the largest, independently owned courier and express freight company in Australia with offices in Victoria, New South Wales, Queensland, South Australia and Western Australia. 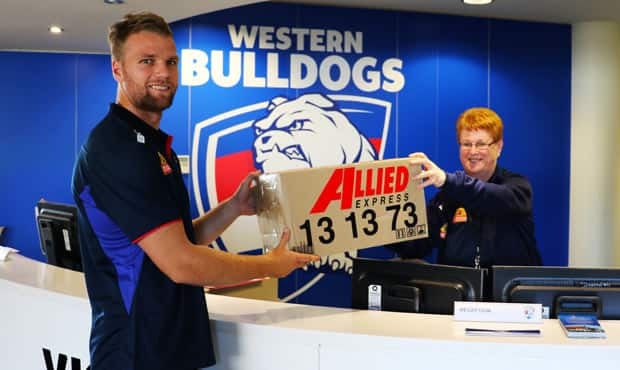 As part of the new partnership, the Allied Express logo will be featured on the Western Bulldogs’ media backdrop and change room signage for the upcoming season, commencing from Sunday’s season opener at Etihad Stadium. Allied Express Managing Director, Michelle McDowell said the transport company was thrilled to be partnering with the Bulldogs. “Allied Express is extremely excited about our partnership with the Western Bulldogs,” McDowell said. Western Bulldogs forward Jake Stringer was on hand to help launch the partnership at Victoria University Whitten Oval on Tuesday afternoon.